Multimodality molecular imaging agents bring together the strength of different imaging modalities to create multiplex probes that overcome the limitations of each single modality . Perhaps, the best marriage is between optical imaging and nuclear imaging modalities such as positron emission tomography (PET) or single-photon emission tomography (SPECT). Such an approach combines the great temporal and spatial resolution provided by optical imaging with the exquisite tissue penetrability and excellent quantitation capabilities of nuclear techniques . In general, nuclear/optical imaging agents feature a single or multiple fluorescent moieties -typically an organic dye- and chelators that can coordinate radiometals. Although the clinical application of such multimodality imaging approaches is still in its infancy, the intense research on the development of novel probes and detection systems is paving the way for the widespread clinical implementation of these technologies . In the probe development front, we have extensive experience in the synthesis and implementation of nuclear/optical imaging agents, in both preclinical and clinical settings [3-5]. Despite the obvious advantages inherent to the multimodality paradigm, preparation and stability of multimodality agents may be challenging. Specifically, the fluorescent signal of the probes may be severely compromised when radiolabeled probes are stored, even for relatively short periods. Hence, understanding the effects of radiation on fluorophores is of paramount importance to avoid loss of fluorescence signal, which will certainly limit the applicability of the nuclear/optical approach. Here, we describe the effect of radiation exposure on the photostability of a series of near-infrared fluorescent compounds. Given their advantageous properties as labels of biological molecules, carbocyanine dyes (e.g. Cy3, Cy5.5, Cy7, Dylight 800, and IRDye 800CW) are among the most commonly used fluorophores employed in fluorescence-based biomedical assays . From those, IRDye 800CW (800CW) and its derivatives are a frequent choice for in vivo imaging, due to their long ~800 nm emission wavelength which minimizes autofluorescence and enhances tissue penetrability [7, 8]. Herein, we employed the native 800CW and a dual modality imaging tetrapeptide conjugated with DOTA and Dylight 800 (RDC018) (Fig. 1A), as a model to study the effects of radiation on the fluorescence of this type of organic molecules. Three radionuclides, 68Ga, 111In, and 213Bi, which present significantly different properties (Fig. 1B) regarding decay mode, half-life, and emission energy were chosen as radiation sources. Near-infrared fluorescent compounds and radionuclides employed in the study. A) Scheme showing the chemical structure of IRDye800CW and RDC018; the latter composed of Dylight 800 (red), a DOTA moiety for radiolabeling (blue) and an HSG targeting moiety (black). B) Relevant nuclear properties of 111In, 68Ga, and 213Bi. The contribution of 213Po is considered in the 213Bi dose. The optimal excitation/emission wavelengths of 800CW and RDC018 were determined by analyzing their spectra (Fig. S1A). For both compounds, 740 nm and 796 nm were selected as excitation and emission wavelength, respectively. The influence of several experimental conditions including buffer, pH, heating, and the addition of metals on 800CW's fluorescence emission at 796 nm was determined (Fig. S1B-D). A marked difference in fluorescent intensity was noted when 800CW was buffered with NaAc, MES, or HEPES. NaAc buffer was employed in all subsequent studies given that 800CW fluorescence was strongest under such conditions. Lowering the pH of the solution resulted in a loss of fluorescence intensity due to the protonation of the indolic nitrogen, and prolonged heating of 800CW at 95 °C provoked a linear decrease in fluorescence intensity; fluorescent intensities were down to 60% of the initial values after one h at 95 °C. Finally, the effect of non-radioactive metals on 800CW fluorescence was tested (Fig. S2). No significant difference (P > 0.05) in fluorescence signal was observed after incubation of 800CW with Ga3+ (6.6 pg) and In3+ (1.3 ng); these concentrations resembled those of the corresponding radioactive metals. Aqueous solutions of 800CW in 0.1 M NaAc (pH 4.5), were exposed to increasing activities of 68Ga, 111In, and 213Bi. The effect of each type of radiation at different activity concentrations was assessed by measuring the fluorescence of the dye - normalized to a non-irradiated control - at different time points. A pronounced dose-dependent decrease in 800CW fluorescence was observed after 30 min exposure to 68Ga (Fig. 2A). 111In and 213Bi presented milder effects at early time points, but prolonged exposures to 111In (e.g. 24 h) also resulted in a significant deterioration of the fluorescence signal (Fig. 2B and Fig. S3). 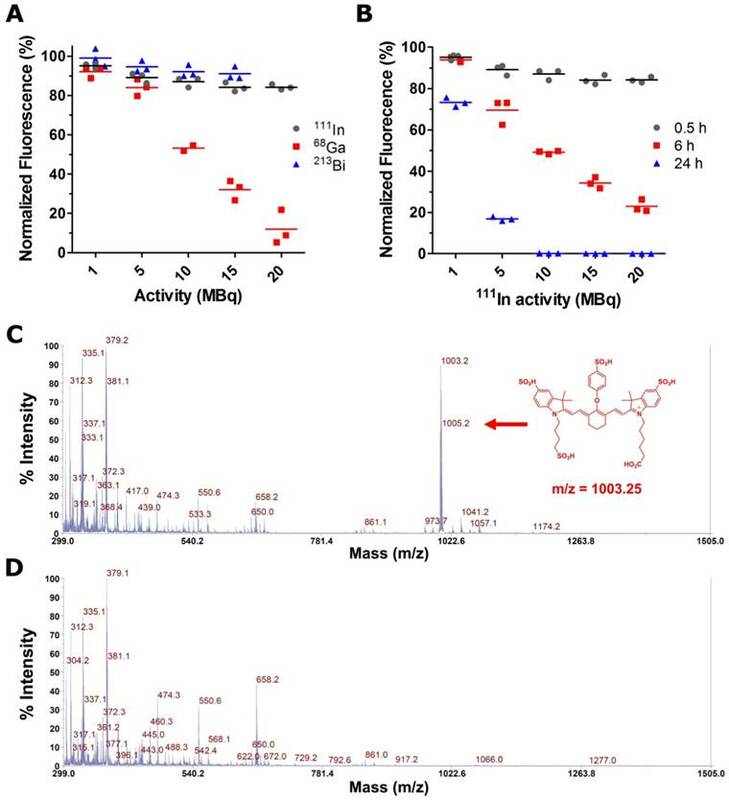 Matrix-assisted desorption ionization time-of-flight (MALDI-TOF) mass spectrometry showed the disappearance of the mass peak corresponding to the intact 800CW (m/z = 1003.2), in the irradiated vs. the non-irradiated samples (Fig. 2C and Fig. 2D), demonstrating the non-reversible radiation-induced degradation of the fluorophore. Unfortunately, due to the complexity of the resulting mass spectrum in the irradiated samples, fragmentation analysis was unfeasible. At similar activity level and exposure time, the extent of radiobleaching for the three radionuclides followed the trend 68Ga>111In>213Bi. Strong 68Ga-induced radiobleaching was also evident in near-infrared fluorescent (NIRF) images, where a notably lower signal was recorded for 68Ga-irradiated solutions (Fig. S4A and B). Based on our dose estimations, 213Bi should have elicited radiobleaching effects that surpassed those observed for 68Ga (Table S1). Such detachment between the estimated dose imparted by the radionuclide and the extent of radiobleaching suggests that the loss of fluorescence was a secondary effect, not mediated by the direct interaction of the fluorophore with the ionizing radiation. The mechanism of water radiolysis leading to the formation of highly reactive H˙, ˙OH, and e-aq radicals is now well understood. Amongst all generated reactive oxygen species (ROS), hydroxyl radicals are the primary oxidizing entities produced during water radiolysis. Such reactive species readily participate in addition reactions (k ~ 1010 M-1s-1) in the presence of conjugated or aromatic organic molecules and are responsible for the observed degradation of organic chromophores after irradiation in aqueous solution [9, 10]. Similarly, scientists have recently described the mechanism of degradation of heptamethine cyanine dyes via oxidative processes involving primarily singlet oxygen (1O2) radicals [11-13]. These studies demonstrated that the sensitivity of cyanine dyes is dictated by both the radical reactivity and the oxidation potential of the dye. The latter is inextricably ligated to the length of the polymethine chain and the presence of electron withdrawing substituents in the indolenine moiety [14-16]. A ˙OH radical mediated radiobleaching mechanism explains the low radiolytic effects observed after 213Bi irradiation of 800CW solutions. During water radiolysis, hydroxyl radical yields, G(˙OH), are highly dependent on the linear energy transfer (LET) of the incident radiation. High LET radiation (e.g. α and heavy ions) generate a densely ionized media that promotes the recombination of ˙OH radical to form less reactive molecular species (e.g. H2O2), which results in significantly lower G(˙OH) [17, 18]. Despite 213Bi decays by β-, it is in secular equilibrium with its radioactive daughter, 213Po, a pure α emitter (t1/2: 3.7 µs, Eα=8.376 MeV). The α radiation from 213Po delivers more than 98% of the dose imparted by the isotopic pair. However, due to its high LET, G(˙OH) associated with 213Po radiation are significantly lower, minimizing any ˙OH-promoted radiobleaching processes. To corroborate the hypothesis of a ˙OH radical mediated degradation of the fluorophores, we determined the effect of the addition of radical scavengers - a strategy that has been widely employed for the protection of organic molecules against free radical-mediated damage - on the radiobleaching of 800CW solutions [19-21]. Normalized 800CW fluorescence was determined after 0.5, 3 and 6 h exposure to 20 MBq of 68Ga in the presence of increasing concentrations of gentisic acid (GA), ethanol (EtOH), and ascorbic acid (AA) (Fig. 3A-C). All scavengers provided some degree of radioprotection, which in the case of GA and EtOH was both concentration and exposure time dependent. Only AA was able to preserve completely 800CW fluorescence after longer radiation exposure, in a much wider range of concentrations (0.001-10 % (w/v)). NIRF images in Fig. S4 reiterate the strong radioprotective effect of relatively low AA concentrations, 0.1 % (w/v), which were able to preserve 800CW's fluorescent signal. AA also provided effective radioprotection against 111In and 213Bi induced radiobleaching (Fig. 3D and Fig. S5). The superior radioprotective properties of AA can be attributed to the very high rate constant (k = 1.1×1010 L.mol-1.s-1) observed in the reaction of ˙OH radicals with AA acid, which is almost one order of magnitude higher than for GA and EtOH [22-24]. Additionally, AA scavenging properties are enhanced by its ability to stabilize two free radicals (Fig. 3E). Photostability of irradiated IRDye 800CW solutions. A) Normalized 800CW fluorescence, 30 min after exposure to increasing activities of 111In, 68Ga, and 213Bi. B) Effect of elapsed time in the radiobleaching of 800CW solutions irradiated with 1-20 MBq of 111In. MALDI-TOF mass spectrum of (C) 800CW and (D) 800CW after incubation with 68Ga (20 MBq). The mass peak corresponding to 800CW (m/z = 1003.2) clearly disappear after irradiation. Radioprotective effects of ˙OH radical scavengers against 68Ga-promoted radiobleaching. Radioprotection curves for (A) GA, (B) EtOH, and (C) AA. D) AA (0.1 % w/v) provides robust radioprotection against 68Ga, 111In, and 213Bi radiation. E) Scheme representing the mechanism of radical stabilization by AA. To investigate whether other fluorophores are as sensitive to radiobleaching, the phenomenon was also investigated in three other common cyanine fluorescent dyes with different polymethine chain lengths (Fig. 4A). The results of a two-hour irradiation of Cy7, Cy5.5, and Cy3 with 68Ga (10 MBq) revealed a marked difference in radiosensitivity between dyes (Fig. 4B). The order in radiosensitivity observed, Cy7, 800CW > Cy5.5 > Cy3, perfectly aligned with the results obtained by Nagano et al., which demonstrated an inverse correlation between the oxidation potential of the dye - a measure of radiosensitivity - and the length of the polymethine chain . The radioprotective properties of AA were generalized for the entire series of dyes given that the addition of the radical scavenger invariably resulted in the inhibition of the radiation-induced fluorophore breakdown. RDC018 is a nuclear/optical targeting agent that holds great promise for pretargeted cancer imaging and pretargeted radionuclide therapy . RDC018 features an NIR fluorescent moiety -with structural and spectral similarity to 800CW ‑ and a chelating group for the conjugation of radiometals (Fig. 1A). Our next step was to investigate the impact of the direct attachment of the radionuclides on the fluorescence of the dual modality construct. This time, we used experimental conditions that resembled the actual preparation of radiolabeled RDC018 for preclinical studies. RDC018 was incubated at 95°C for 15 min with much higher activity levels: 350 MBq (~10 mCi) of 68Ga, 116 MBq (~3 mCi) of 111In, and 30 MBq (~1 mCi) of 213Bi, respectively. This experiment intended to mimic practical radiolabeling conditions, where radiobleaching effects are expected to be more drastic. As expected, after 6 h of incubation with either radionuclide, a complete loss of RDC018's fluorescence was observed (Fig. 4A). This corroborated the similarities between 800CW and RDC018 in terms of radiostability. In another set of studies, an intermediate concentration of 0.1 % (w/v) of AA was added to the solutions before exposure to radiation. As observed with 800CW, the fluorescence signal was quantitatively preserved in 68Ga and 111In-irradiated samples. Interestingly, solutions exposed to 213Bi still showed a ~40% decline in fluorescence even in the presence of AA (Fig. 4B). 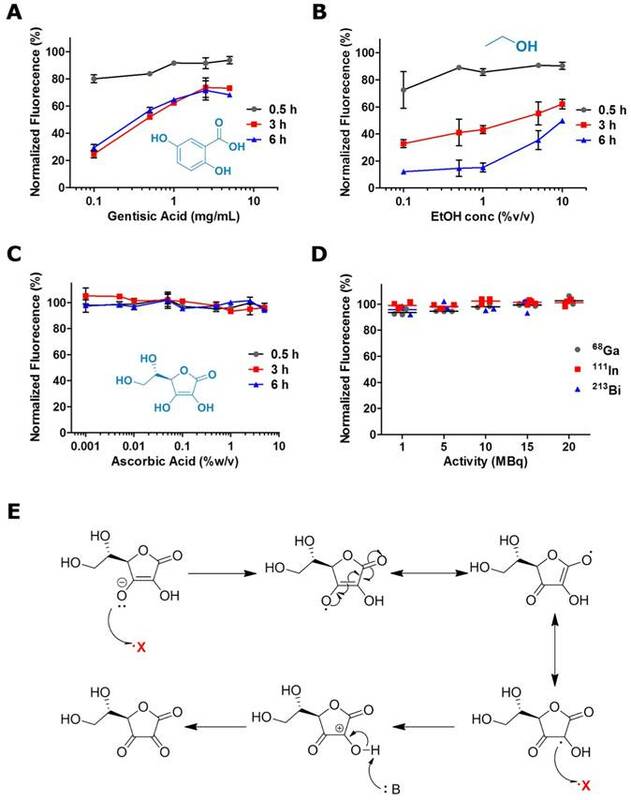 These results indicated that 213Bi-induced radiobleaching of RDC018 was not solely determined by interaction with ˙OH radicals. Detailed experiments describing the radiobleaching of RDC018 with 213Bi are shown in Fig. 4C. Although the exposure to 213Bi did not result in a complete loss of fluorescence, at similar activity concentrations, RDC018 radiobleaching was more pronounced than the observed for 800CW (Fig. 4D). These findings, together with the fact that AA was only able to provide limited radioprotection suggest the direct interaction of α particles with RDC018 molecule. The chelation of 213Bi by DOTA likely plays a vital role on the enhanced radiosensitivity RDC018, since the proximity of the fluorophore to the chelated 213Bi, increases the probability of a direct ionization of the fluorophore by α particles. Similar results have been widely reported in radiobiology, where radiation damage from high-LET α particles occurs via the direct ionization of the DNA molecule, independently of the presence of reactive radical species (oxygen enhancement ratio, OER ~ 1) [25, 26]. To date, the relevance of radiobleaching within the context of molecular imaging remains overlooked. To the best of our knowledge, the radiostability of commonly used cyanine fluorescent dyes has not been systematically investigated before. Herein, we have shown that this family of fluorophores, particularly those that absorb light in the NIR range, are highly susceptible to radiobleaching, even at relatively low activity concentrations. Such phenomenon has been proven of immense potential for in vivo ROS sensing, fluorescence-based dosimetry, and, more recently, for the radical-facilitated release (uncaging) of cytotoxic agents from radio/photo-sensitive antibody-drug conjugates [14, 27]. Importantly, we also demonstrated that radioprotection is achievable through the addition of radical scavengers to the irradiated solution, even at the high activity levels required for preclinical/clinical imaging studies. Such a simple and versatile strategy will be of great impact for improving the application of nuclear/optical dual modality imaging agents; an aspect of vital importance for future successful clinical application where high stability of the imaging probes is required. A) Structure of four common cyanine dyes: 800CW, Cy7, Cy5.5, and Cy3. B) 68Ga-induced radiobleaching of the dyes in the presence (+) or absence (-) of ascorbic acid (0.1% w/v). The dyes showed markedly different radiosensitivities: Cy7, 800CW > Cy5.5 > Cy3. Photostability and radioprotection of RDC018. 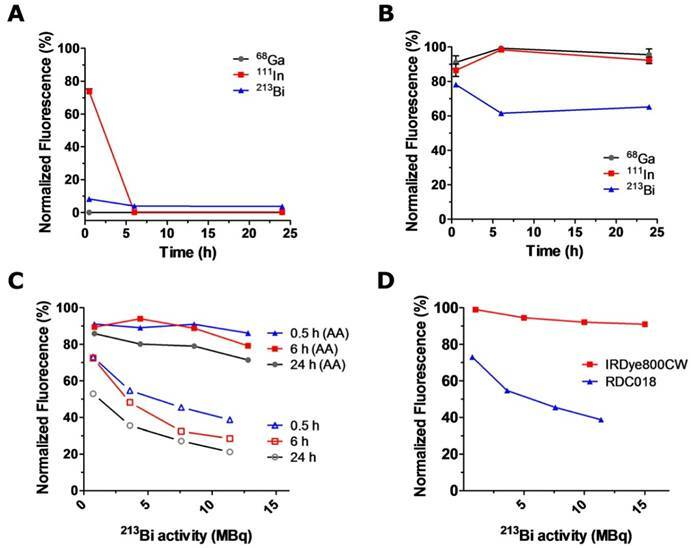 Radiobleaching (A) and 0.1 % (w/v) AA radioprotection (B) of RDC018 exposed to elevated activities of 68Ga, 111In, and 213Bi. (C) Activity-dependent radiobleaching (open symbols) and 0.1 % (w/v) AA radioprotection (filled symbols) of 213Bi-labeled RDC018 solutions. 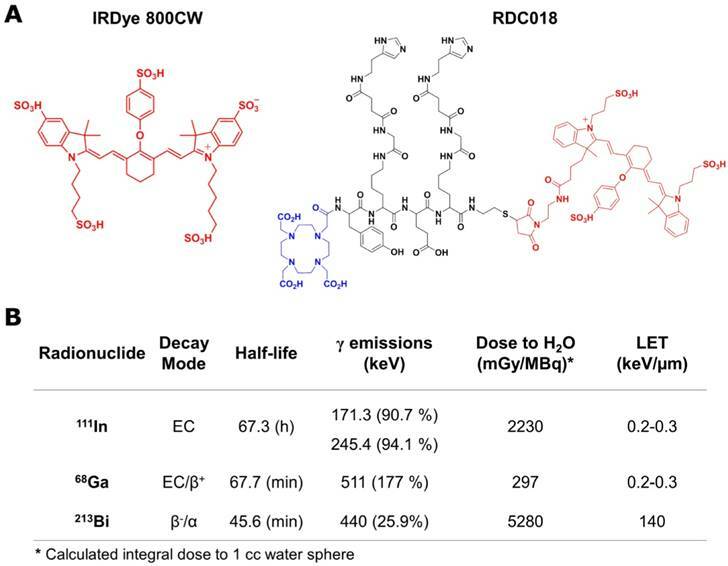 Complete preservation of RDC018 fluorescence was not achieved in this case (D) Comparison of IRDye800CW vs. RDC018 radiobleaching upon 213Bi irradiation. RDC018 displayed significantly reduced radiostability due to direct interaction with α particles. The authors thank Dr. Feng Chen for his insightful comments on the manuscript and Hector F. Valdovinos for his assistance with isotope production. Special thanks to the Graduate Research Opportunity Worldwide (GROW) program and the Netherlands Organisation for Scientific Research (NWO) for auspicing this research. This work was supported, in part, the National Science Foundation (DGE-1256259), and the National Institutes of Health (5T32GM08349).